The year ‘2007’ is the date carved on the back of my shortbread mold. As the holidays roll around again and I take it from its designated place in the pantry to bake another batch, I’m reminded of my friend Michelle who introduced me to the recipe and technique for baking it. As I spent time mixing the flours and butter together with my finger-tips, it gave me the chance to pause and remember her family and the wonderful time we had baking them together. When I first got the mold I wondered about the significance of the thistle that was carved in it. I’m all about tradition especially as it relates to food and the rituals surrounding it, so of course I had to do some digging. The hole I dug wasn’t very deep when I found that the thistle is the national emblem of Scotland. And no, I didn’t just use Wikipedia. The reason, the story goes, is that a troop of sleeping Scots were saved from ambush when a Norse army tried to sneak up on them. One of the attackers stepped on a thistle with his bare feet. I know that hurt! He let out a “Yelp!” waking the Scottish soldiers who went on to defeat the invaders. What a great story, right? How many of us invaded our parent’s bed and let out a squeal to rouse them from slumber the morning after the jolly man in the red jumpsuit had stopped by? It’s the re-telling of stories that connects us to each other and those who have gone before us. Rekindle memories or make new ones in the kitchen this holiday season. Line a 7-inch square baking pan with parchment paper, allowing two sides of the paper to over-hang the edge of the pan. 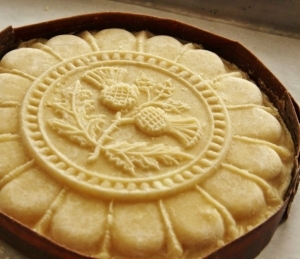 If using a shortbread mold, dust the interior of the mold with flour, taping out the excess. In a medium bowl, using a whisk, stir together flour, semolina and sugar. With your fingertips, rub in butter until mixture resembles fine bread crumbs. Press the dough into the pan/mold into an even layer. Prick all over with fork and sprinkle with the pearl sugar, if using. Bake 30 to 35 minutes in 325°F oven. Cool slightly and score into wedges so shortbread can be broken (cutting into pieces is thought to bring bad luck to the recipient). *If wooden mold is used, turn shortbread out onto cookie sheet and encircle with brown paper collar to keep dough from spreading. Bake as directed above. Notes from Michelle: I just lightly flour the mold and then tap the edge of it to get it out onto the cookie sheet. I make a collar out of brown paper bag handles that I soak in water and let dry.